Oranges are round citrus fruits with juicy flesh and pebbled orange skin. Oranges can be sweet or bitter. Sweet oranges, such as Valencia, navel (a seedless variety), and blood oranges, are available all year, though their peak season is from December to April. Bitter oranges, such as Seville, and bergamot are used primarily for the essential oils found in their zest or skin. For example, the oil of bergamot gives Earl Grey tea its distinctive flavor. Interesting trivia about oranges: Christopher Columbus brought the first orange seeds and seedlings to the New World on his second voyage in 1493. One medium orange, about the size of a tennis ball, contains 65 calories and 16 grams of carbohydrates. Keep in mind that larger portions will contain more calories and carbs, so if you purchase very large oranges, you may only want to eat half in one sitting. The glycemic effect of oranges is minimal, meaning it doesn't raise your blood sugar. The estimated glycemic load for one orange is 11, which is low. The fresh fruit contains virtually no fats and is cholesterol-free. 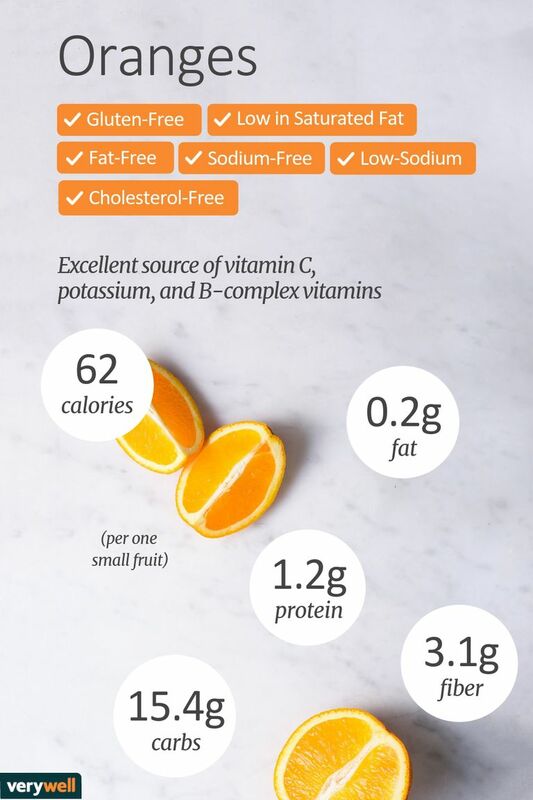 Oranges have a minimal amount of protein. You should include other protein sources in your diet to meet your daily needs. Oranges are an excellent source of vitamin C, more than grapefruit, packing in more than a day's worth of this immune-boosting nutrient in one small serving. Vitamin C is a powerful antioxidant that has anti-aging properties, plus it's also important in the production of the proteins necessary for keeping skin youthful. Vitamin C also plays a role in cell repair and wound healing. Oranges also provide bone-strengthening calcium, potassium, thiamin, and folate. Potassium can help to lower blood pressure. Some studies suggest that those people with the highest intakes of thiamin are at decreased risk of developing cataracts. And folate is important in fetal development—adequate intake can prevent neural tube defects. Oranges are a fiber-rich fruit, providing 16 percent of your daily needs. Besides keeping you regular, fiber delivers a slew of other benefits, from helping you maintain a healthy weight to lowering your risk of heart disease, diabetes, and some types of cancer. Oranges also contain phytonutrients that can protect cells from damage and lower the risk of cardiovascular disease. How do I choose an orange? Choose fresh oranges that feel plump and heavy for their size. The heavier the fruit, the juicier it will be. They should have unblemished skin, free of nicks. Don't be afraid of oranges that have a green rind, as the color of the skin depends on weather conditions. You can also test for freshness by smelling it: If it doesn't smell like orange, move on to the next one. Should I store oranges in the refrigerator? Oranges don't ripen much after they've been picked, so keeping them in the fridge can help them last for a few weeks as opposed to about a week on the counter. Can I eat the peel of an orange? Yes. It can taste bitter, but the peel—like the fruit itself—is actually a good source of vitamins and minerals like vitamin C and potassium. You can also eat the pith, the stringy white stuff between the peel and the fruit; it too is high in fiber and vitamin C.
I peeled my orange and noticed it's red inside. Is it safe to eat? Yes, you probably purchased a blood orange. Blood oranges are a sweet type of orange with rough, reddish skin and streaked blood-red colored flesh. They can be eaten raw, juiced, or used in salads and sauces. Is drinking orange juice as a healthy as eating a fresh orange? Aim to consume fresh oranges instead of OJ to receive the maximum amount of fiber and nutrients. Rather than drinking juice, which can add excess calories and sugar to your diet and raise blood sugar rapidly, use a freshly squeezed squirt of orange juice to add flavor to meats, water, and vegetables. Eat oranges raw by hand or add them to salads, sauces, or desserts. Grate or julienne the zest for sauces or garnish. Their sweet flavor and beautiful coloring can add some pizzazz to a simple chicken or fish dish. Start your morning with a few orange slices to accompany your egg dish, or slice one up into chunks and add it to your yogurt or salad. Use the juice to make low-calorie, flavorful sauces, and marinades. Fruits like oranges don't commonly cause allergic reactions, and even when they do, the symptoms are usually mild and involve irritation and itching of the mouth. Anaphylaxis is rare, though one recent case almost proved fatal for a toddler. Citrus fruits can be strong photosensitizers, substances that create sensitivity to light, so avoid eating them when you're going to be exposed to the sun to prevent burning. Unlike grapefruit and other citrus fruits that contain furanocoumarins, the culprit behind "the grapefruit juice effect," sweet oranges likes navel and Valencia don't contain these substances, which can cause potentially dangerous interactions with some drugs. Labensky, SR, Hause, AM. On Cooking: A Textbook of Culinary Fundamentals. 3rd ed. Upper Sadle River, NJ: Prentice-Hall, 2003: 638. United States Department of Agriculture. National Nutrient Database for Standard Reference Legacy Release. Is Grapefruit Healthy For You? What Are the Nutrition Facts for Lemons? Are Tangerines a Diet-Friendly Fruit? What Nutrients Are Found in Papayas?